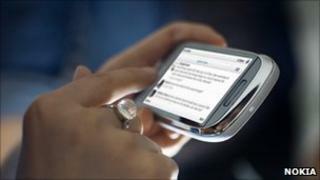 Mobile phone maker Nokia has posted better-than-expected profits for the first three months of 2011, down 1% to 344m euros (£304m). But its market share fell 4% to 29% as cheaper rivals and the popularity of competitors' smartphones ate into Nokia's dominance. Nokia also said that it had struck a long-awaited deal to develop smartphone technology with Microsoft. Investors welcomed the news, sending Nokia shares up almost 3%. Stephen Elop, chief executive, said: "In the first quarter, we shifted from defining our strategy to executing our strategy. On this front, I am pleased to report that we signed our definitive agreement with Microsoft and already our product design and engineering work is well underway." The Finnish company's slow response to the smartphone threat from Apple's iPhone and the Blackberry handsets has been one of investors' key concerns. On Wednesday Apple unveiled a 95% rise in first-quarter profits, and said it had sold a record 18.65 million iPhones during the quarter. Consultants Strategy Analytics said that Apple had now overtaken Nokia as the world's largest handset seller in revenue terms. Despite shifting more than 108.5 million handsets in the last quarter - almost six times that sold by Apple - Strategy says that the US's firms revenues from its more expensive phones far outstripped its Finnish rival's. Nokia's new-ish chief executive Stephen Elop will be relieved that sales are holding up fairly well. If customers don't stay loyal to the brand, if network operators start to focus on other handset makers, Nokia's decline could be swift and brutal. So it is crucial for Nokia to retain a hefty market share until its technical turnaround kicks in. That won't be before the end of the year though, when the first Nokia phones sporting Microsoft's Windows Phone 7 operating system will hit the market. For mobile phones, that's a delay of half a lifetime, given the current breakneck speed of innovation. The numbers also demonstrate Nokia's Achilles' heel: In terms of handsets sold, Nokia is still a giant. Last quarter it sold 583% more phones than Apple. But its margins are razor-thin, and it's little wonder that in terms of both revenue and profits Apple is now a larger phone maker. Nokia will hope it made the right bet opting for Microsoft rather than Google's Android operating system for mobiles. In a report published on Thursday, Strategy estimated that Apple's wholesale revenues for its iPhone division were $11.9bn (£7bn, 8bn euros) in the first quarter, against $9.4bn for Nokia. Under the Microsoft deal, Nokia will start using the US company's software on its smartphones instead of its own Symbian platform. Nokia said the deal will enable it to cut annual costs by around 1bn euros. Nokia's group sales rose by 9% to 10.40bn euros, while smartphone sales were up 6% at 7bn euros. The company's key phone unit reported an operating profit margin of 9.8% for the January-March period, well ahead of analysts forecast of 8.6%. However, Nokia said that for the full year, margins would fall to within a 6%-9% range. "Finalisation of the agreement with Microsoft means Nokia can now focus on execution, but margin guidance underlines that difficult times lie ahead as it transitions the portfolio," said analyst Geoff Blaber from CCS Insight. Despite the drop in Nokia's market share - the first time in a decade it has fallen below 30% - Sami Sarkamies, analyst at Nordea, said: "The first quarter was very strong, much better than expected. "It seems the situation is under control, there were no dramatic changes," he added.